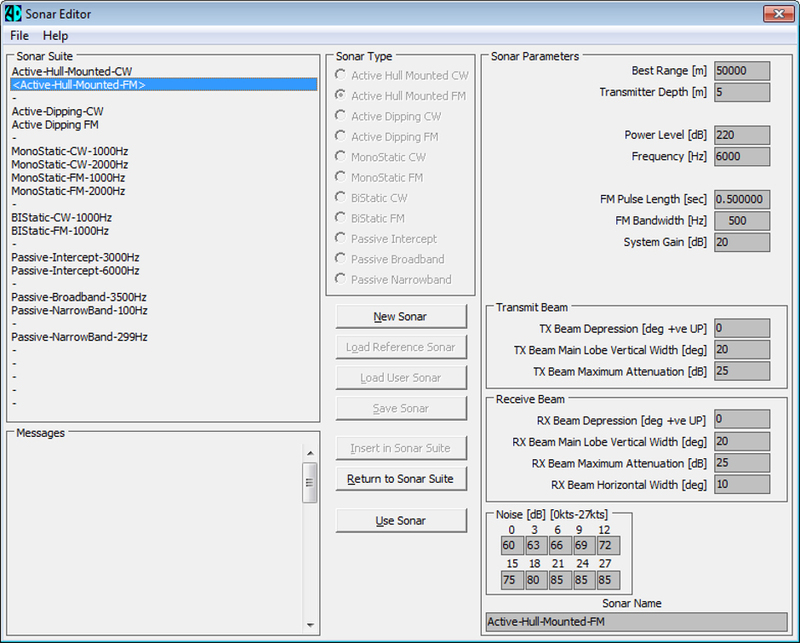 The Sonar Editor is where users define detailed parameters for their own and other sonar systems. A full range of parameters can be defined from basic source levels to transducer beam parameters (depression, width and side lobe level). This data can be supplied by the user at run time or by shore side support staff in advance of the requirement. WADER is provided with a dedicated storage area which the program code will always treat as ‘read only’ so that baseline sonar data cannot be corrupted. The data shown above is for a fictitious active sonar. The SPUTS (Sonar Parameters for Unclassified Training Scenarios) dataset is provided with WADER. SPUTS is a set of fictitious sonars that behave like their real counterparts and can be used for training. WADER contains both the sonar files themselves and the associated documentation which replicates the look-up tables an operator may have to access while on operation.